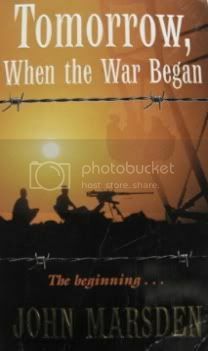 Tomorrow When the War Began series that is, by John Marsden. The first book came out when I was at high school, I know I waited and waited to read it and then the queue at the library was so long for any others that that was where I stopped reading the series. But recently I've worked my way through the True Blood books (which I loved!) and felt the need to continue on reading another series, something light and easy. And so, Tomorrow When The War Began it was. I've almost finished the 2nd book at the moment. Yes, it is written for teenagers, but it's super mindless reading. I'm watching the DVD as I type too, I'll let you know what I think later. Oooh, I'll have to look those p Sydney, they sound good!